Tiny Dangerous Dungeons now out on Steam! Hey folks! My Game Boy inspired mini-metroidvania Tiny Dangerous Dungeons is now out on Steam! https://store.steampowered.com/app/1013650/ Get it at -10% launch discount for first week! The Steam version is an extended edition of the original browser game (Play here: https://www.newgrounds.com/portal/view/628826) and features Time Trial mode, wider resolution, controller support, improved controls and entirely new lava themed area to explore with new power-up to find! Tiny Dangerous Dungeons is coming to Steam! Hop into a classic Game Boy inspired metroidvania adventure with the little treasure hunter Timmy! Explore a huge and open dungeon, collect hidden power-ups and gain new skills to aid you on your quest! Can you survive the Tiny Dangerous Dungeons and find the presumably huge treasure? 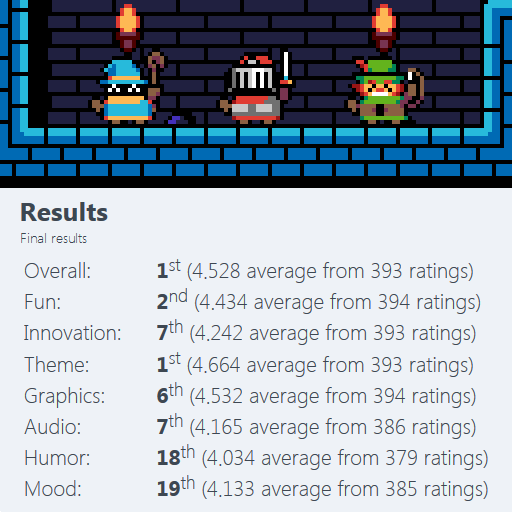 Total Party Kill, Ludum Dare winner! Super Dangerous Dungeons is now out on Steam! Now out on Steam: https://store.steampowered.com/app/856540 Get it for 10% off during the release week! Steam version features support for controllers, fullscreen, cloud saving and has extra Sand Dungeon! - Over 50 challenging levels, including bosses and secret stages! Super Dangerous Dungeons now out on App Store! - 48 challenging levels, including bosses and secret stages! - 19 Achievements to prove your dungeon mastery! Tiny Dangerous Dungeons now out on App Store! Android version is in the works! Based on my hit Newgrounds game http://www.newgrounds.com/portal/view/628826, this is the extended edition of the original game, featuring larger mobile resolution, new Time Trial mode with a leaderboard for speedrunners, larger dungeon with completely new area to explore, and new ability and max health upgrades to find! Get SwapQuest! Now out on the App Store! SwapQuest is a collab project of mine and Rebusmind, it's a puzzle rpg where you pick a hero, and build a road for them to walk on by swapping tiles. You need to outrun the evil demon cloud Horde, all while battling monsters, collecting treasures, and completing quests. You can play as 5 different classes, each with their own skills, equipment and weapons to buy and upgrade. Duke Dashington! Now out in App Store! Hey folks! I have released my very first commercial mobile game! - Simple touch controls! Swipe your finger on the screen to to make Duke dash! - 4 vastly different temples to explore! - Over 100 rooms of deadly traps and mind-boggling puzzles! Persist now available on Android! You can now grab and play my game Persist on your Android device, completely free!